Note: This turned into a long post but I hope you will find time to read anyway! How can it be that it was June last time we posted to this blog? Where did the time go?! Well, actually some of mine went on doing two courses about Working in a Series, which I thought it was time to tell you all about. I really wanted to do the course run by Lisa Call on her own website but it was very expensive so when the opportunity to do a course run by Elizabeth Barton on Quilt University for around 1/10 of the price I thought maybe that was the way to go. So I signed up to that. The very act of doing that seemed to confirm to me how much I really also wanted to do the other one. So I signed up to Lisa Call’s class as well the same day. For anyone on a budget, I would say that I had no complaints about the Quilt University course. It was a four week course and the method of teaching is that a lesson is made available for you to print off each class week and interaction with the students and teacher is by way of a sort of chat site. That means you can read all interactions with other students and learn from those too although a downside is that the list of messages can get long and clunky. I now have two filofaxes ( both Cubans for readers who care) in use for this purpose with my subjects tabbed but its very flexible. I like that I can do something at lunch at work on a scrap and take it home to file later. 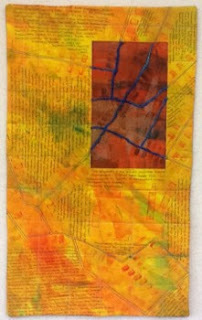 Secondly I began to work small, because of time constraints and to try out some new surface design techniques, making fabric with scraped screen inks and stamps. I was pleased with my fences made from stitch, paint and abaca tissue. 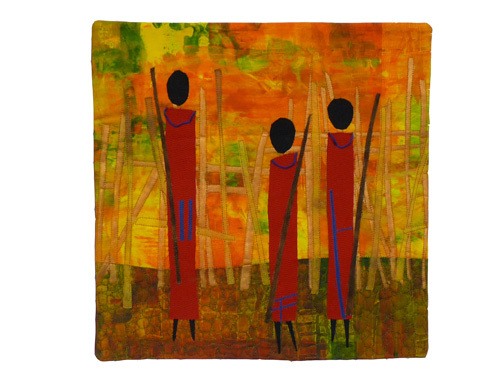 The first quilt in this post is my SAQA Auction donation for this year. I do think it is a step forward for me. I am delighted to see it was chosen for the auction publicty material. These followed on and were submitted for a show in Australia but were rejected. which is frustrating as they are miles better in my view than the one that was accepted for the same exhibition the last time it ran! Ah well. Firstly the emphasis was on the visual not the story behind it and whilst there is nothing wrong with that it was not satisfying me deep down. Secondly, I was doing rather realistic pictures and I am now ( after some weeks for reflection) starting to realise that if I am not doing completely abstract work I at least prefer to have some symbolism in the work. Something that can be interpreted and worked out. Or at least something that holds attention and invited reading ( either literally of words, or figuratively interms of searching for meaning). 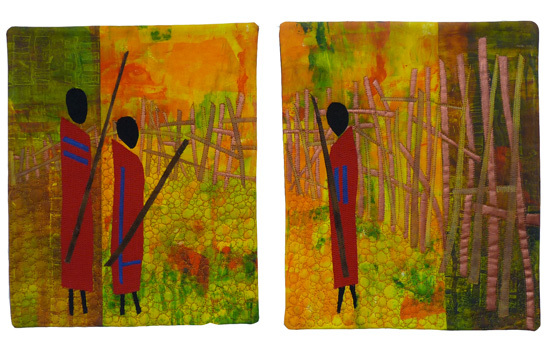 Two spear toting men by a fence. Too easy! So, that course was a good start but I was still rather restless being confined to a series. Of course, working in multiple series at a time is always a possibility but I could see that with limited time there was a real risk I would do twelve series of one quilt each per year! Not quite the point. So that Quilt University course was a good start but I was looking for more. Then came the Lisa Call course. This was a much more detailed and professionally put together course and well worth the money. Lisa used her computer skills to set up a website for the course and the formatting (both of the site and the course) was really impressive. We studied with Lisa over eight weeks. On six there was a long ( at least 75 mins) live lecture withher during which you could phone in to listen and interact with her. Or, it was recorded and, as I was in an inconvenient time zone, I downloaded and listened like a podcast in my own time, taking notes as I went. Court users in Blackburn may have wondered why I was spending some time alone in my car at lunch time but it was a perfect time to get some concentrated listening time! In addition there were several substantial emails eachweek. There was interaction with Lisa via the comments on the siteblog but also we got two half hour individual mentoring phone calls each. It was typical of Lisa’s organisation that these were not just nice chit chats. We got a call preparation sheet with some set questions on to prepare and this meant Lisa was able to use every minute (well after a few pleasantries!) to answer our questions and to offer focused advice and mentoring. Apparently some people used those calls to ask technical questions about the course material. I found all that was so clear I really didn’t want clarification and instead I opted to use it as a mentoring call. Lisa appears to be someone I have much in common with but who is further down the path than me and it was most useful to be able to pry into her experiences and have full and open answers. In fact one thing we talked about was the possibility of using a professional creativity coach and about her experience of that being useful for a while and then going wrong and how important it was to get a coach that had the right skills and practice ethos. I had briefly flirted with that idea for a while having been in touch with Eric Maisel who is maybe better known as a coach for writers although he is certainly not limited to that. I came to the conclusion that there were better places I could put my money particularly as I don’t feel stuck or blocked. Besides Eric Maisel seems to have put all he knows into his many books so there is plenty for me to read there if I need to. That said, if Lisa ever went into professional mentoring services I’d jump at the chance to work with her. 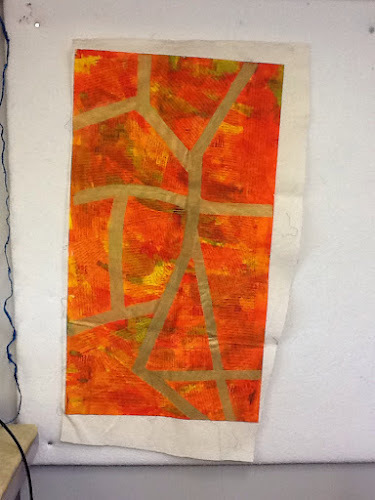 One way in which she structured the course was to take a topic – say ‘balance’ and talk about how wec ould apply that to our art, to working in a series in particular, but also to the life of being an artist and our studio practice. So it was part practical, part psychology really, which I loved. And it wasn’t waffly stuff. It was backed up with articles on psychological research and from her own experience, both successes and mistakes. Good stuff and something to go back to over and over. Each week she also featured an artist whose work illustrated the lecture points so there is plenty of material to explore further there too. We had five exercises to do during the course ( catch up weeks were built in) and they involved both freewriting journal exercises (and you know how happy I am to curl up with a notebook and do that!) and then the making of a piece of art. 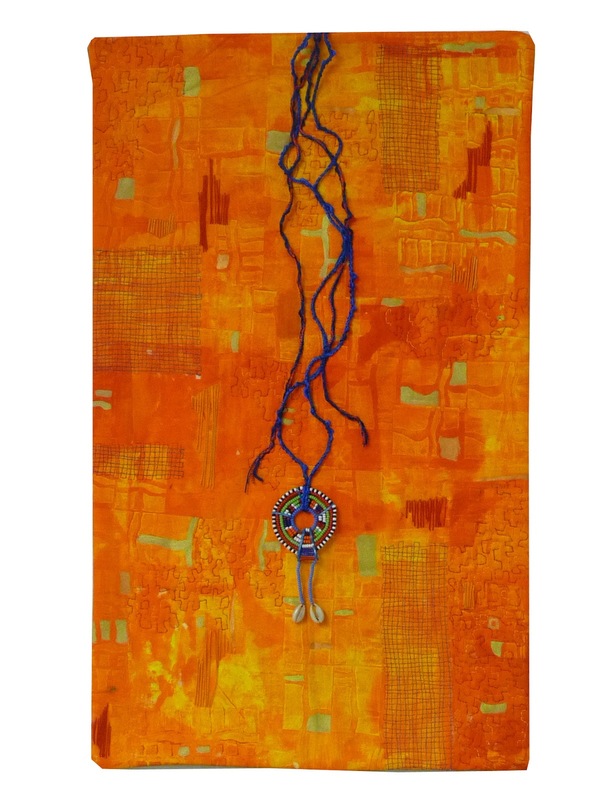 The clever thing about this course is that the first task is for you to set the parameters of your own work so that you can decide what is feasible in the time you have. So you pick size, subject, media, how far down the production process you will go. Basically you set yourself up to succeed in completion. Or you do if you are not overambitious like I tend to be! I decided to put the Maasi to one side and try somethingnew. 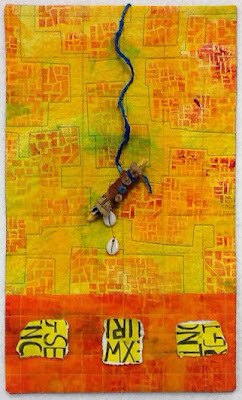 Just before this course started I had been invited to submit a quilt for the Fibre Artists for Hope Group on the theme of Broad Changes, an exhibition about women who made a difference in the field of social justice. 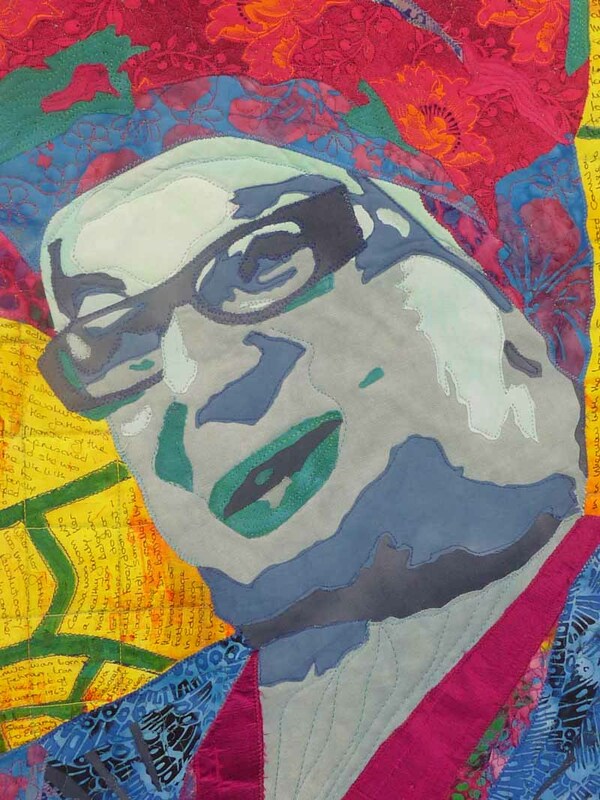 Immediately I wanted to do a quilt about Camila Batmangheldidge, which is ironic as I still cannot spell her name without a Google assist! She is a charity worker in the UK and whilst she is Iranian I can see that her dress makes her not a million miles away from the African Ladies I have made a few times. I do love fabric headwear of all kinds! So I decided myc lass exercises would be trial portraits of Camila. At the same time, as you know, the Twelve by Twelve group had embarked on the 20/12 project and I wanted my works for that to hang together as a series. This sort of multi-tasking or synchronising of effort pleases me! The exercises were, just as a way to structure the course,based on various formal design principles, but we were given several choices of task, including setting ourselves a task, so it enabled everyone to adapt the course to their own interests and needs. There was no need to feel you were faffing about with pointless irrelevant games or working at a level below or above you. Lisa did ask if she could share some of our work on her blog. I did not consent to that, for reasons I am about to explain, but, after a few weeks more reflection and with the ability to place it in context I am ready to reveal all. Or, actually not all because I did not do all the exercises. But that’s Ok with me, and I do not see it as a failure, because the course moved me from where I was, to where I wanted to be without me doing the last one. Plus, I had confirmed that I really work better independently where I can take what I need and apply it to my own work with thought and in my own way.That is not to say that the tasks are not useful but rather that I am finding it more beneficial to apply them in a normal studio practice and to my own goals rather than to produce something for the sake of a class deadline. That said, I did do three portraits of Camila B. Now, I am only sharing on the basis that you are kind to me (and I think I require another pot of Rooibos tea and a slice of Millionaires Shortbread to fortify me before I do so). The basic idea ( again I do not want to give too much of the course away) was that you start with a reference work and set parameters for your work. So I started with this twelve inch test piece but I decided my class work would be 16 x 24 and would all involve a painted portrait. This was particularly stupid as I had never painted before and in fact always said I quilted because I couldn’t paint. But you know, you’ve got to challenge yourself…! Now, no laughing…. For my first assignment I chose the task of working in a monochrome scheme. And the third was this half finished piece wth no background ever done. The outcome of these assignments was that I grew immensely in confidence that I was getting better as I went along but still knew that I was nowhere near where I wanted to be. Two, almost throwaway comments, I pickedup on the course ( and which I wrote on my dry wipe board) were ‘Its OK to bewhere you are’ and ‘Its Ok to be a student’. They sound simple, and indeed they are, but to an over achieving perfectionist they were very comforting and important points. So, at that point I found an art teacher who is now coming to my house to teach me to draw and paint so I can do what I know I can do if I learn how to! I set Camila B. aside and decided to change horses and work with maps. The maps thing came out of the 20/12 project to which I was applying the lesson from Lisa to define your parameters and change one thing at a time. So my 20/12 parameters were, obviously, the size, and then an African theme with a focus on wholecloth surface design, and a colour scheme that meant my pieces all hung well together. The first one on the metamorphosis theme was sort of part of the Maasi series. Or not, but vaguely linked to it. The second was Vilakazi Street. In the making of this I stumbled on a great site about the Soweto Riots in 1976 which maps the various routes taken by student groups and the Police during the conflicts and tells the stories of the people involved. That got me excited and I thought I had a series right there. 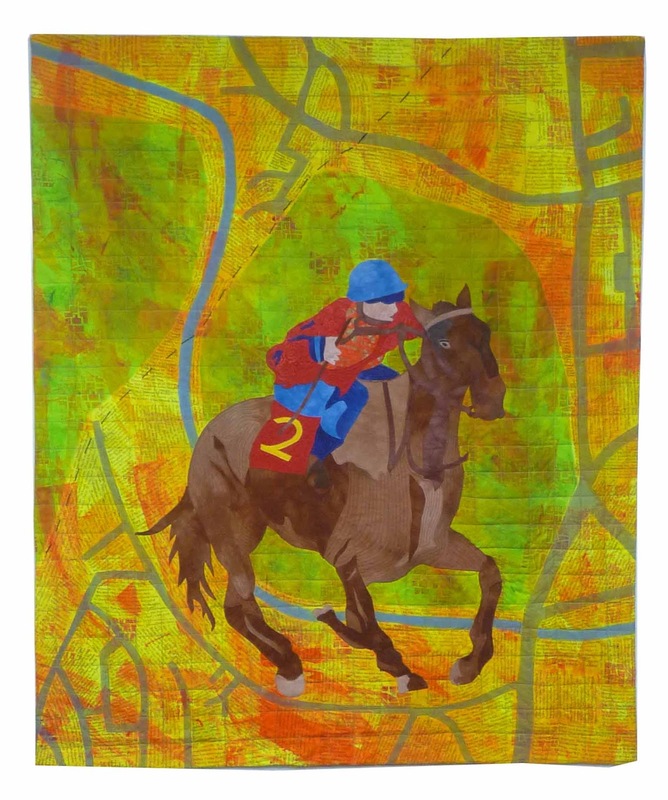 Maps of the routes with the stories on the quilts. That met so many things I wanted in a series… something that could change endlessly without boring me, something that enabled me to tell a story and something which linked to my passions rather than being picked because I thought it would make a goods eries. So, I took another route, the Police route made some fabric by my current favoured method of scraping and stamping with screen inks, and…disaster. It did not work. But, that was another thing I internalised from the course. Artists make bad work. Move on. And move on without beating yourself up. It’sthat last bit that was new to me! So, I shoved that in the cupboard and had a think. Camila had to be made. The deadline has now been extended but at the time I had a comfortable but not overly commodious time in which to do it. My art teacher is good but on one lesson a month I am not going to be painting faces on quilts well enough to want to submit them any time soon. Time for a rethink. So I reverted to fabric portraits. 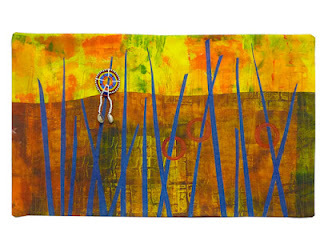 I followed Maria Elkins instructions on her Quilting Arts Download. Well, I followed them in so far as I am capable for following any instructions without deciding to go my own way!That is I to say I put a photo into photoshop. I then adapted the instructions and used the xxxxxxxxx filterprinted that out in colour in reverse and the right way around and then extended the print out to finish the parts of her missing in the photo. I outlined in black. I traced over each piece I needed to make on typing paper then reversed it to go on fusible by, um well, I don’t recommend this but by holding it up and sort of more or less putting some marks on the back of the paper as it flops about. It is not precise but it works for me and I then can trim the fabric and play about with it. I should use a lightbox or even work in day light at the window. But hey, it’s my work and slapdash corrected is more me than perfect from the start. It’s just more fun! 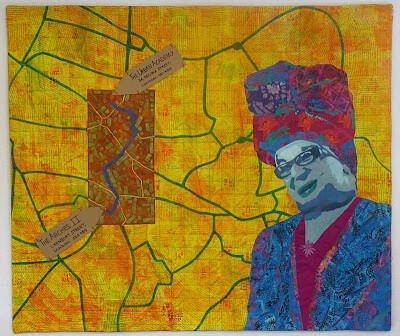 I have fused the portrait to a scraped and stamped background and then I used the same method as on Vilakazi Street to do a map of the areas of London whereshe works and to write in her story and that of her charity. And this finally is where I wanted to be in terms of working in a series. Because the deadline on Camila B was extended I put the top unstitched to one side and for a while to work on another one for my colleagues wall at work. This was the result. 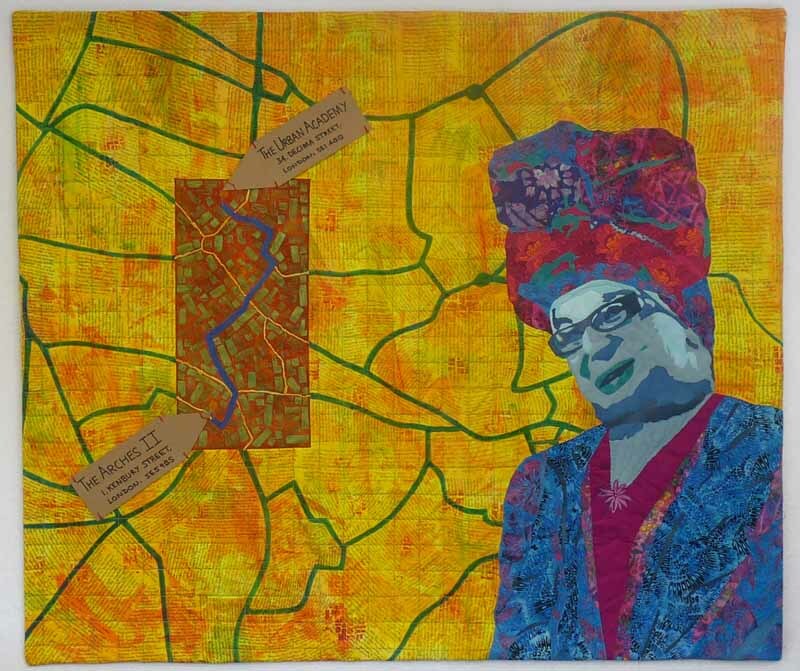 I think this is better than Camila B. I let go of the central motif that carried over from Vilakazi street and learned that is is better to ensure the map chosen is featureful as it is withot a gimmick. And so this could go on. I can change the people and the place and the stories, even the colours I use and the methods to delineate the road and buildings and the method of getting writing onto the quilt so I don’t feel at all restrained but the work will be a cohesive collection whilst still being fresh. I hope! The last 20/12quilt on Mythology was a spin off from this maps idea also, with its city blocks background. i am currenltly having a break from the studio for a couple of weeks but I know one of my first projects when I get back will be another map quily. There is no doubt in my mind that it took Lisa Call’s course to get me to this point and I will always be very grateful to her. There are other lessons I learned and indeed, at least one other series involving township shacks under way too. So, that was a lot about me. But I am curious. Does working in a series appeal to you? What a fascinating post, Helen! I couldn't put it down. Thanks for the insights; it just reaffirmed to me that there is no way I can decide ahead of time to make a series of anything. While it might be a good idea in theory, in practice it feels too forced to me -- and I have a sense that it may feel a bit forced to you, too -- notwithstanding the huge benefits you reaped from Lisa's course. Obviously, it got you to a turning point and I will be interested in seeing what happens as you move along in your journey. P.S. - have not had a chance to get to the post office - it always seems to be closed when I am going past. Did you ever hear of a P.O that doesn't open till 10 in the morning? I should get it out tomorrow. Bluehost is definitely one of the best web-hosting provider with plans for all of your hosting requirments.